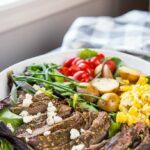 Slow Cooker Hearty Steak Salad is a simple and fresh meal that makes it easy to eat fresh and healthy even on busy summer nights! Raise your hand if you think that because the weather is getting warmer, it’s time to pack away your slow cooker. Put those hands down and listen up! I can’t say this enough times because this is what I truly live and breathe….. warm weather, summer break, spring time evenings…. these are the absolute BEST times to use your slow cooker! So don’t pack it up! 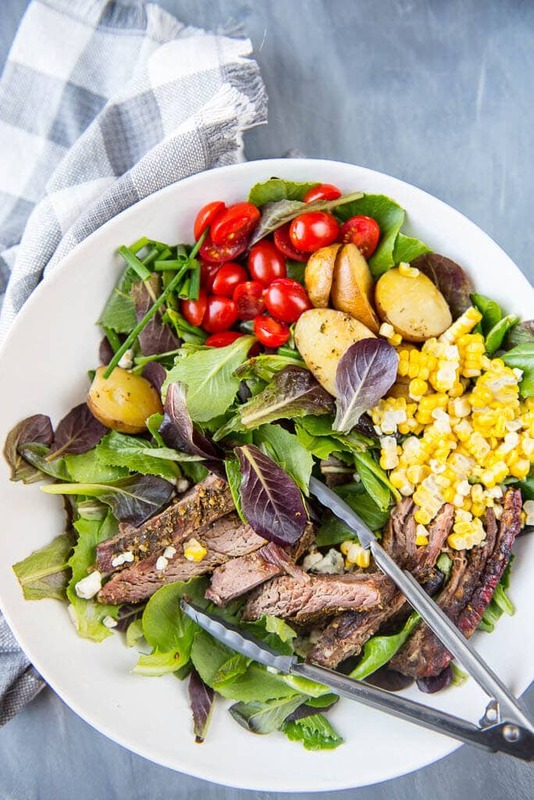 Give it a permanent spot on the kitchen counter instead and keep a constant rotation of fresh, healthy and delicious meals going everyday, like this Slow Cooker Hearty Steak Salad (aka a Cowboy Salad). 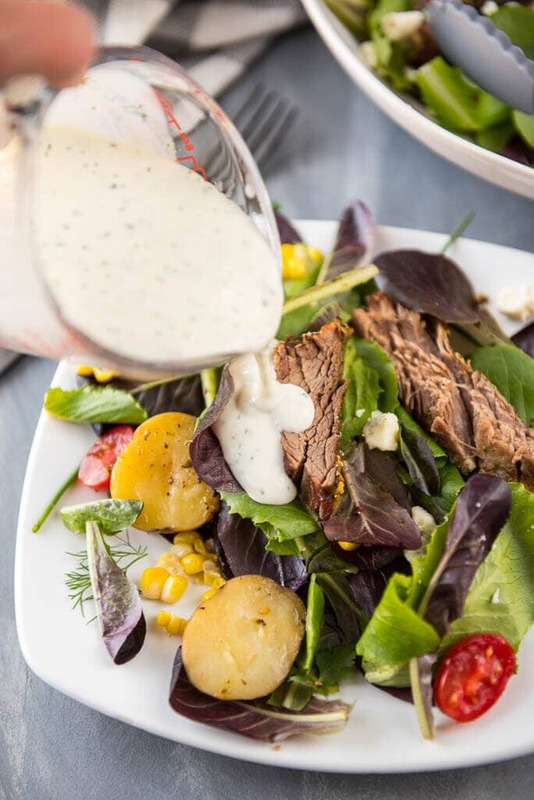 I realize that when you think of slow cooker meals, steak and salad are probably the furthest things from your mind. And at first glance, it does seem a little insane. But trust me on this one, you want a simple meal packed with fresh veggie and yet hearty enough for every appetite? 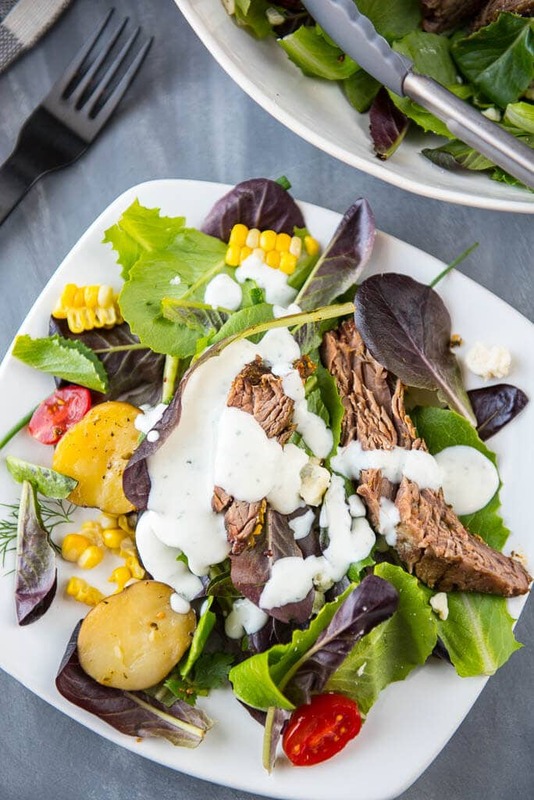 This steak salad has it all plus you get to take away the hard work of standing at the grill and instead enjoy a nice cold beverage while you do the maybe 10 minutes tops worth of work to get this to the table. 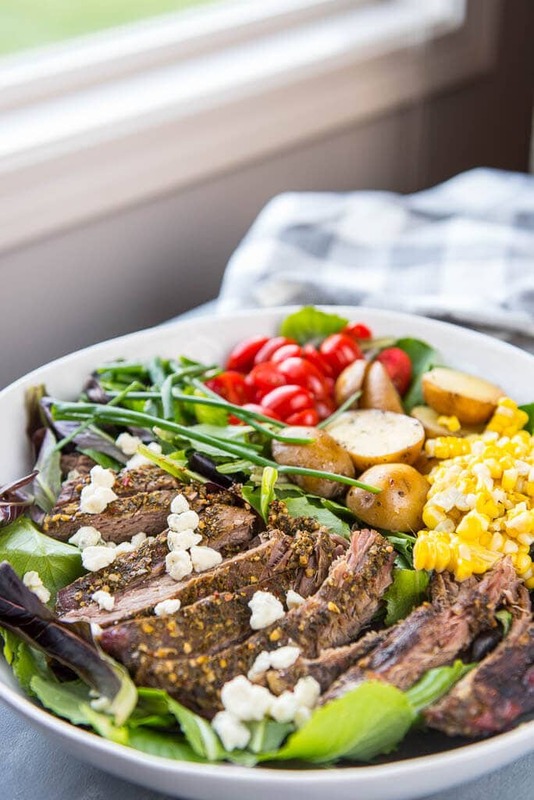 Flank steak is the perfect cut of meat for cooking in the slow cooker and makes a great salad topper. 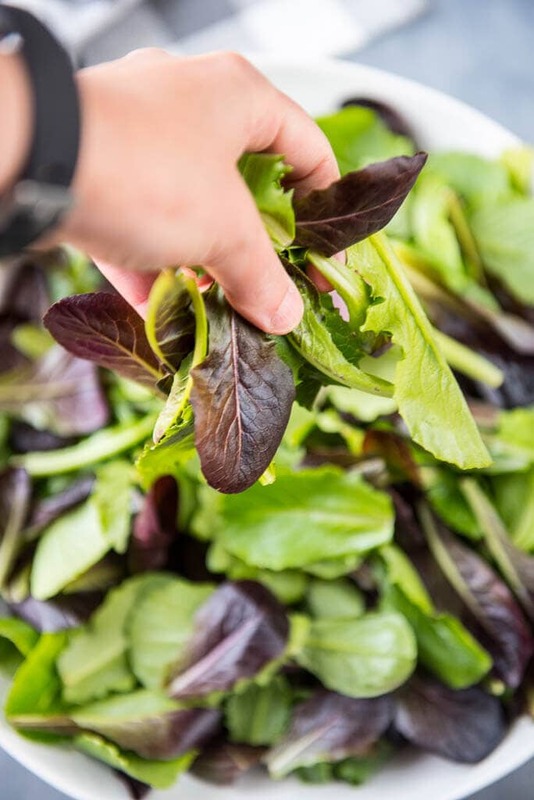 Perfectly tender and packed full of flavor and we don’t even stop there. It’s like a steak dinner on a salad! Packed with hearty little baby potatoes and sweet in season corn-on-the-cob that cooks right there in the same slow cooker. I used my , but any large slow cooker will work. Making homemade dressings is simple and totally worth it. I actually added a spoonful of my homemade dried ranch seasoning and it was so tasty. Love fresh recipe ideas for your slow cooker? 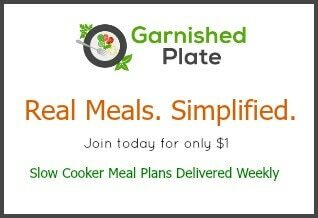 Make sure you check out our delicious make-ahead meal ideas, delivered weekly! Love making your own seasoning blends? 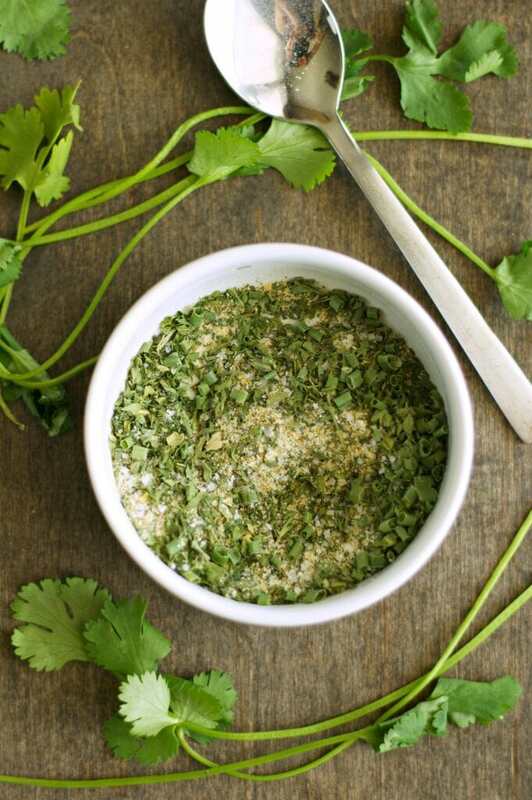 This ranch seasoning is so simple and perfect for keeping on hand for summer meals! Want a fresh meal idea for chicken? 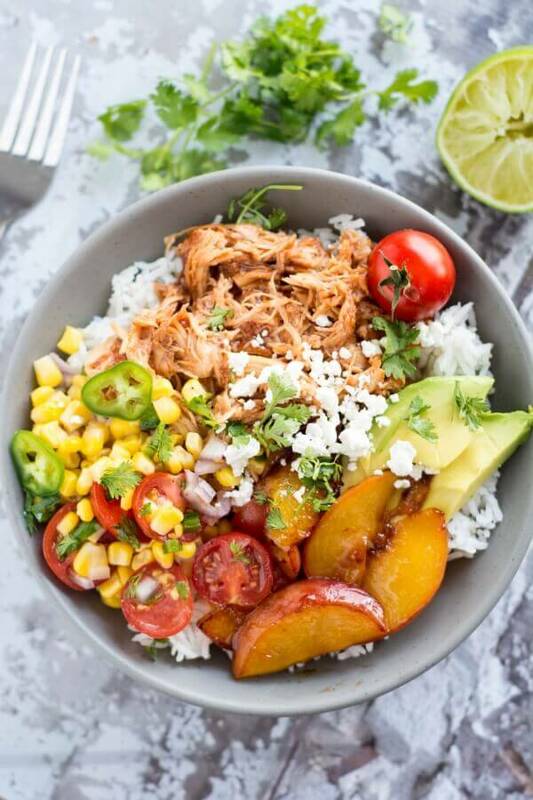 How about these flavorful Jalapeño Peach Chicken Bowls?